This weekend saw 28 sailors from across the country compete for the title of RN Inter Region Dinghy Team Racing Champions. 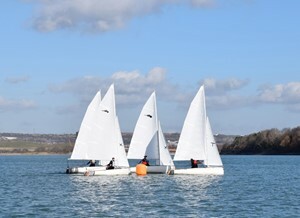 Regional squads from West, North and East as well as teams from Southampton and Bristol URNUs raced one another over 2 days in Bosun dinghies from the RN Sailing Centre, HMS EXCELLENT. Intense competition afloat was accompanied by a convivial atmosphere ashore, particularly at the RNSA Annual Dinner on Saturday evening. The weekend began with a team racing tactics discussion on Friday evening led by Hamish Walker, a serving RNSA member and former ISAF World Team Racing Champion. The discussions continued ashore over a meal as the sailors rekindled old friendships and formed some new ones. Saturday morning saw the teams arrive at a gloriously sunny RNSC but without a breath of wind, the start was inevitably delayed. While the crews enjoyed the sunny weather, Race Officer Richard Tarr set off in the safety boat to assess the conditions. After a couple of hours delay, the breeze slowly began to fill in from the west and the fleet of 8 dinghies launched for the much anticipated racing. Despite challenging, shifty conditions the race management team (which included incoming RNSA Commodore RAdm Chris Gardner and Vice-Commodore Cdre Phil Warwick) flew through the 21 races required. Short races around a small, square course ensured many close battles between competitors, with sailing skill and knowledge of the Rules tested to the limit. By 1530 the racing was complete and the placing decided for Sunday’s competition: North, East and Bristol URNU A would compete for the Cup while West, Southampton URNU and Bristol URNU B would fight it out for the Plate. The RNSA AGM and prize giving were next on the agenda followed by a very successful RNSA Annual Dinner, all of which were held at the Hornet Services Sailing Club in Gosport. More than 20 of the Holt Cup sailors and many of the support crew attended a superb dinner at which the new Commodore had his first opportunity to address the association. The ensuing run ashore was equally enjoyed by all. Sunday morning saw the crews arrive to race for the Cup and Plate. The winds were more favourable from the off with around 6-8kts Southerly breeze which held throughout the day. Racing was if anything closer than the previous day and crews had to take every advantage of tidal stream and wind to maximise their chances. Gavin Marshall and Hamish Walker turned their attention to coaching from the safety boats, passing on their skills to less experienced team racers. Eighteen races later and it was the home team who took the glory with Eastern Region winning the Cup while West romped home to a comfortable victory in the Plate. RAdm Gardner kindly presented the prizes that afternoon in the RNSC. Overall the weekend was a success with many new skills learnt, contacts made and the RNSA message strengthened throughout the community of RN sailors. Onwards to the Inter-Services! Special thanks go to volunteers Richard Tarr, Wayne Shirley, Bill Flanagan, Patrick Smyth and Clare Hunter without whom the event would not have been possible and to Claire Smith and the team at RNSC for their hard work preparing equipment prior to the event and support on the water.